Setting up a Skype for Business Meeting on behalf of someone else, for example a manager, is similar to setting up one for yourself. First, the person you’re scheduling the meeting for needs to add you as a delegate in their Outlook calendar and in Skype for Business. Then, you can set up Skype for Business Meetings, start impromptu Skype for Business Meetings, and start conference calls on behalf of that person. Note: To be or have a delegate, you must be using Outlook. First, the steps below must be done by the person who is giving delegate access. 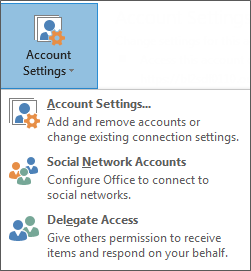 In Outlook, click File > Account Settings > Delegate Access > Add. Find and add the name of the person who is going to be the delegate. Click the Calendar menu, and select Editor rights. For more information, see Allow someone else to manage your mail and calendar. As a delegate, you can access the calendar of the person you’re a delegate for and set up a Skype for Business Meeting just like any other meeting. To schedule a Skype for Business Meeting on behalf of someone you’re a delegate for, simply follow the steps at Set up a Lync Meeting. As a delegate, you can also start an impromptu meeting, by using the Meet Now feature or a conference call for someone else. In the Skype for Business main window, click the Options menu, and then click Show Menu Bar. On the menu bar, click Meet Now. Click the name of the person who has given you delegate access. This opens a meeting window. Pause on the people menu to invite participants. Invitees receive an alert that notifies them of a meeting request. In your Contacts list, select the names of the invitees, including the person who has given you delegate access, by holding down the Ctrl key on your keyboard and clicking the names. Right-click the selection, and point to Start a Conference Call. 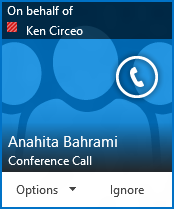 Point to the name of the person who has given you delegate access, and then click Skype for Business Call.